Some Ferguson Tractor Operator Manuals PDF above the page. The range of Ferguson TE tractors was introduced in England in 1946, after 30 years of continuous development of the "Ferguson System" since 1916. The first work was to develop a plow and a clutch to integrate the tractor with its work in such a way that the engineering whole. The automatic control system is now used by almost all manufacturers of tractors around the world. The British patent was filed by Harry Ferguson in 1925 and granted the following year. By the beginning of the 1930s, the communication design was completed and now accepted as an international standard I. Only one prototype of the Ferguson System tractor, known as Ferguson Black, was built for further technical development and demonstration to potential manufacturers. In 1936, the first production tractors Ferguson were built in Huddersfield, Yorkshire, by David Brown. This tractor, model Ferguson 'A', included the Harry Ferguson hydraulic control system from the suction side, the key to solving the sensitive automatic control of three-point mounted guns and patented on February 5, 1936 (patent No. 470069). The combination of the three-point clutch of Ferguson patented on July 3, 1928 (patent No. 320084) with its suction side control valve, is the key to the success of all subsequent Ferguson tractors and then Massey Ferguson the most important of which are the TE and TO 20 models. To get volume production at lower costs, after demonstrating his tractor in front of Henry Ford in October 1938, Ferguson concluded a gentleman's agreement or also called a handshake agreement with Ford for the production of the Ferguson tractor in Detroit, beginning in mid-1990-1939. ] 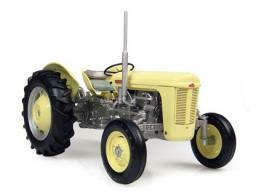 About 300,000 of these tractors, known as Ford Fergusons, were manufactured before June 30, 1947. During the war, the team of Ferguson designers developed many improvements for both the tractor and the tools and began to prepare for production in the United Kingdom. The agreement with Ford in 1938 was to include production at the Ford plant in Dagenham, Essex, but the British company Ford did not. By 1945, Ferguson had entered into a manufacturing agreement with Standard Motor Company of Coventry for the production of the Ferguson tractor, incorporating all of its latest improvements and known as the TE20. Just as Ferguson allows him to bring his tractor to full production, the deal was of great use to Standard, as the tractor would be built on a huge "shadow factory" that was an aircraft engine during the Second World War, but now it was empty and it was useless for what was a relatively small automotive company. The Standard has developed a new wet engine for the tractor, which, in turn, will be used in Standard road vehicles, such as Vanguard.